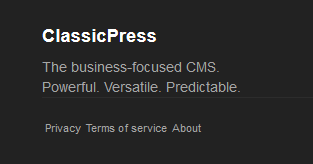 Noticed a couple small issues with the footer here on the site. One more tiny thing: at the right-hand side of the footer, there’s a link to Slack. The URL is pointing to Slack’s TLD, rather than the CP/Slack signup page; I believe this may have been an oversight. Thanks @CodePotent for noticing those! I have updated the links as suggested (& fixed the slack link), and am working on the hover colour now. Man, you’re quick on the draw - looks great on this end! I will add that to my to-do list for tomorrow, should be really simple to implement!